Interesting paper on Innate Immunity, Asthma Risk and Amish vs Hutterite families – microBEnet: the microbiology of the Built Environment network. The Amish and Hutterites are U.S. agricultural populations whose lifestyles are remarkably similar in many respects but whose farming practices, in particular, are distinct; the former follow traditional farming practices whereas the latter use industrialized farming practices. The populations also show striking disparities in the prevalence of asthma, and little is known about the immune responses underlying these disparities. We studied environmental exposures, genetic ancestry, and immune profiles among 60 Amish and Hutterite children, measuring levels of allergens and endotoxins and assessing the microbiome composition of indoor dust samples. Whole blood was collected to measure serum IgE levels, cytokine responses, and gene expression, and peripheral-blood leukocytes were phenotyped with flow cytometry. 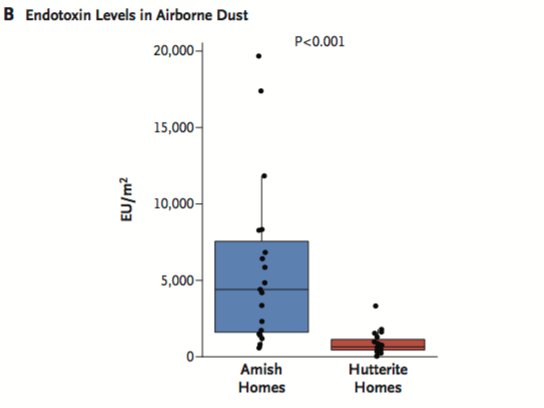 The effects of dust extracts obtained from Amish and Hutterite homes on immune and airway responses were assessed in a murine model of experimental allergic asthma. Despite the similar genetic ancestries and lifestyles of Amish and Hutterite children, the prevalence of asthma and allergic sensitization was 4 and 6 times as low in the Amish, whereas median endotoxin levels in Amish house dust was 6.8 times as high. Differences in microbial composition were also observed in dust samples from Amish and Hutterite homes. Profound differences in the proportions, phenotypes, and functions of innate immune cells were also found between the two groups of children. In a mouse model of experimental allergic asthma, the intranasal instillation of dust extracts from Amish but not Hutterite homes significantly inhibited airway hyperreactivity and eosinophilia. These protective effects were abrogated in mice that were deficient in MyD88 and Trif, molecules that are critical in innate immune signaling. The paper seems, at first look, quite solid and interesting and definitely worth a look. One critical aspect of this paper which is fascinating is how they tried to tease apart the effects of genetics and environment by looking at these two groups. First, they show that the groups are actually quite genetically similar to each other. One of the clear implications of this paper (and what the authors and reporters emphasize in the news stories) is that differences in the microbial communities between the Amish and Hutterite communities and thus differences in microbial exposure may be driving some of the differences in asthma. This implication seems pretty straightforward from this work although it is not conclusively proven in the current paper. One thing they do to test whether what they observe is just a correlation is to use the dust for experiments in mice – exposing mice with different genetic backgrounds to the dust and seeing what their response is. The dust from Amish homes had different effects than the dust from Hutterite homes. And most interestingly, mice with defects in innate immune system functions no longer showed differential responses to the dust, suggesting that the innate immune system was involved in mediating the response. Overall a very nice study. One thing I liked in particular was their handling of the potential limitations of their work. See the section below from the Discussion which is how the paper wraps up. Such discussions of limitations need to be done much more in the literature in my mind. Our study has several limitations. First, we were unable to include children younger than 6 years of age, we collected samples at a single time point, and the numbers of Amish and Hutterite children in our study were relatively small. As a result, we may have missed important windows of immune development or lacked the ability to detect early, subtle shifts in cell composition, response, or phenotype that are critical for immune maturation. Second, our microbiome assessments were limited, since only pooled dust samples from a limited number of homes were available for the studies in which we assessed bacterial composition. Therefore, we cannot further dissect microbial composition and identify potentially protective microbes to target. However, the striking differences found in endotoxin levels support the notion that the Amish indoor environment is much richer in microbial exposures than the Hutterite environment. Third, the strategy used for sampling the Hutterite children enriched selection for those with asthma, although the prevalence of asthma in our sample was similar to that reported in previous population-based studies.11 Moreover, the exclusion of children with asthma or allergic sensitization from our analyses of gene expression, cell composition, and immune phenotypes did not affect the outcomes. Our study in a small number of children was sufficient to show significant differences in the prevalence of asthma and in immune profiles, suggesting that very strong environmental factors must account for these differences. Indeed, we showed that there are remarkable genetic similarities between Amish and Hutterite children. 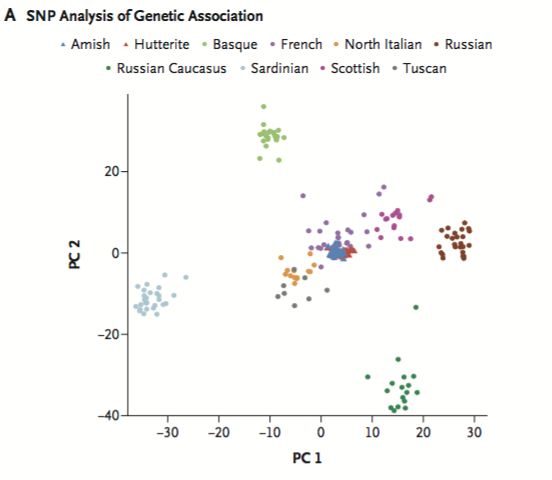 Although we interrogated only common variants, other variants that occur at very low frequency in these populations are unlikely to account for the observed large differences in the prevalence of asthma. In the end, the novelty of our work lies in the identification of innate immunity as the primary target of the protective Amish environment, a finding supported by results obtained in both humans and mice. Conversely, our work suggests that susceptibility to asthma may be increased when innate immune stimulation is weak. A deeper understanding of the relevant stimuli and the innate immune pathways they engage may ultimately pave the way for the development of effective strategies for the prevention of asthma. So – overall this seems to be a nice piece of work and an important contribution to the growing literature on microbiology of the built environment and also on trying to track down connections between microbial exposure and the development of asthma. On that last note, I do feel compelled to note one part of this paper that strikes me as a bit strange. As I note above – there is a growing literature on microbes and asthma and related topics and even extensive studies of microbes in dust and how that might be used to study the connection between microbes and the development of asthma. I even wrote a blog post three days ago about exactly this topic because I found a nice new review paper that I thought did a really good job of reviewing the field: Paper of interest: Pediatric Asthma and the Indoor Microbial Environment. Somewhat surprisingly – a lot of the studies mentioned in this review that seem directly relevant to this new work are not discussed in this new paper. It would have been better in my mind to try to place this new work in a fuller context of all the work on microbiomes, asthma, dust and homes and related topics. Maybe because I just wrote that blog post about the topic a few days ago I am biased here and certainly there are lots of possible explanations for not citing these papers or related ones in the new work here. But whatever the explanations it seems to me it would have been better to do a more thorough job of placing this new work in a fuller context of other work on this (or related) topics. And I worry that by not providing that context, people will think that this current paper is isolated and that other people are not working on similar topics.